You'd think MIT students would know better, but I guess they're just letting anyone in these days. Or maybe they're just not studying Newtonian physics anymore. Either way, it's pretty embarrassing when you try to pull a boat out of the water with a pickup truck and then have to get the truck towed out of the water. The MSP Dive Team was called out to the Mystic River tonight to assist with getting a Ford Ranger out of the Mystic River. MIT students had been testing out a remote controlled boat, weighing over 1,000 lbs. 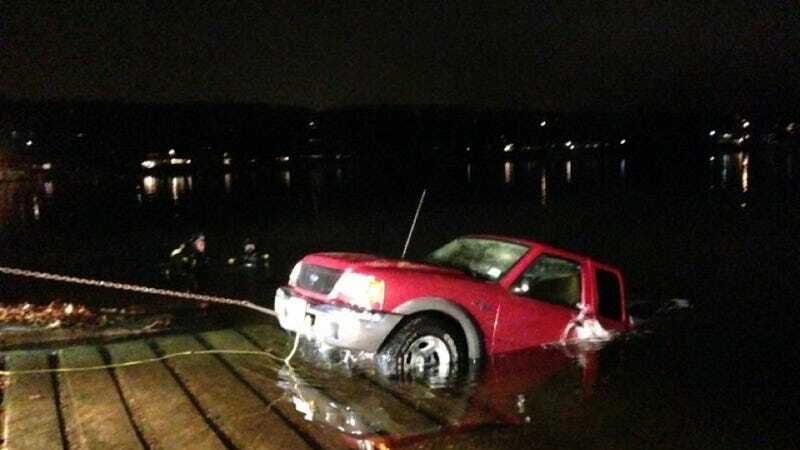 Apparently this Ford Ranger could not easily pull the boat out.